Between November, 2007 and March, 2008, the Hamburg Das Comitee team took photographs of over 350 people in Hamburg, Munich, Vienna, Dresden, Frankfurt, Berlin, Amsterdam, Moscow, Belgrade, London, Barcelona, Paris and Milan. Dictators featured are Adolf Hitler (book cover), Josef Stalin, Saddam Hussein, Robert Mugabe, Mao Zedong, Nicolae Ceausescu, Slobodan Milošević, Benito Mussolini, Pol Pot, Idi Amin, Kim Il-sung, Augusto Pinochet and Francisco Franco. Photographs at the exhibition are 1.80m x 2.30m, high-resolution digital images that expose every tiny detail of their faces, framed in a way that these leaders would never have tolerated themselves – without uniform, without autocratic gestures, without cheering crowds. The portrait of Hitler consists of 37 people. His nose belongs to an estate agent from Berlin, his upper lip to a locksmith in Dresden. His hair is put together from the hair of an artist in Weiden and a painter in Bamberg. The chin stems from a Hamburg restaurant owner, the eyes are those of a bank advisor in Frankfurt, the lachrymal sacks are from a precision mechanic in Bautzen, the throat is that of a Viennese banker, the beard belongs to a chef from Wuppertal. Every wrinkle, eyebrow and mole has been replicated true to the original so that it is possible to get a direct and close impression of every scar, nose hair, wide pore and other fine details. 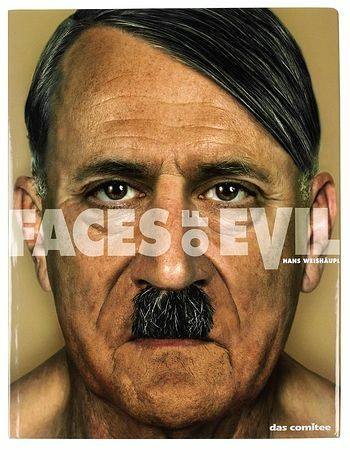 The Faces of Evil project was developed at Das Comittee, Hamburg, by creative director/photographer/image manipulator/art director Hans Weishäupl, photographer Janet Riedel, copywriter Dirk Silz, typographer Gunta Lauck, and account handler Helen Zeggai. See Hans Weishäupl’s earlier work for NOAH, featuring Hitler, Caucescu and Hussein. Image by Hans Weishäupl above from Spiegel. 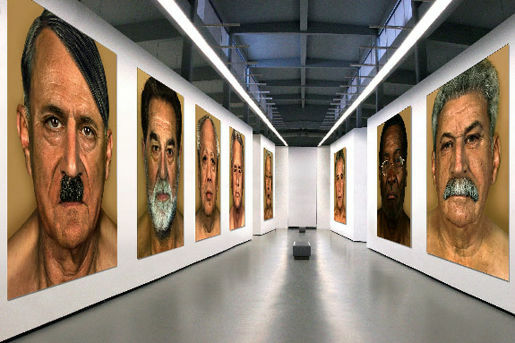 The Faces of Evil project also won two awards at the ADC Gipfel der Kreativität 2009.